And she’s selling the stairway to heaven. There’s a vacancy coming to save her. One of the popular metaphors for decision-making in the information age is the “Knowledge Hierarchy.” It is based on the idea that we start with raw data and gradually process it through stages until it becomes wisdom suitable for making good choices. Some people apply this to professional development over the career of a chain store real estate executive. When you’re young, you simply see data, but as you get more experience and insight, you are able to use your wisdom to evaluate sites. The fact is, each site must be evaluated through a process that starts with raw data that is enhanced with verification, context, and benchmarks until it is ready for the application of human wisdom. The human brain uses pattern recognition and analogies to analyze complex decisions. This is why “analog stores” are popular in site selection. If we can find existing stores that are similar to a proposed location, we can adjust the details and apply our knowledge of its sales performance to the new site. The data for the proposed site must be accurate. If we are going to use an estimated trade area, presence of competitors, site characteristics, and other factors in the comparison to existing stores, they must be verified or we will end up using the wrong analogs! The context must be comparable, not just the raw data. If there are three competitors within a mile for an urban site, that’s very different than having three competitors within a mile for a rural site. In addition to urbanicity, other contexts include the level of brand awareness, regional differences, and the format of the real estate (shopping center type and size). Special insights into the unique qualities of the proposed and analog sites. No two sites are exactly alike, and no information system can capture every relevant factor. Has a major employer left town? Is there a new school under construction across the street? Has the crime rate been growing or getting better? Is there a NASCAR track nearby? Did the landlord just renovate the center? These insights must be captured in “comment” fields and used in the comparison between the proposed site and analog stores to make sure that the sales number for the existing store is truly an indicator of what to expect from the new site. 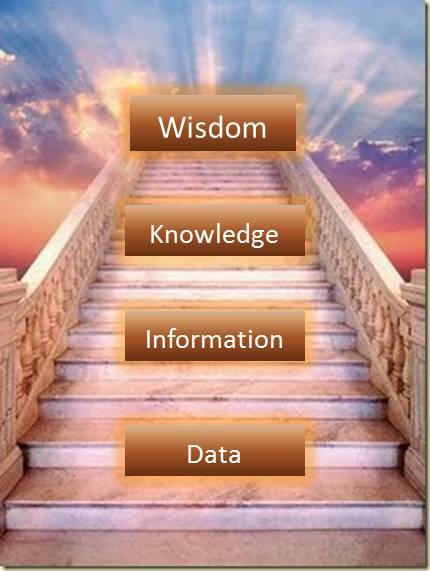 Where do predictive models fit into the “Stairway to Wisdom?” Like people, they rely upon verified data and context to produce knowledge. Garbage in, garbage out. Does the model capture all the unique insights about the proposed site and use its calculations as a substitute for human wisdom? I don’t think so. There really is NO substitute for the human wisdom that is ultimately used to make the decision. However, predictive models can transform verified data into knowledge that becomes another valuable input to the final decision process. What am I doing to make sure that the data I collect, load, and maintain in my information system is accurate? Are the business locations (including my stores) in the right places on the maps? Are all the key competitors plotted correctly and updated as they open and close? What am I using for analog stores? Do I compare suburban to urban stores and miss the context of the demographic numbers? How am I collecting insights about unique features of both my existing stores and proposed sites? Is there a “comments” field in the database that tells me about these things? Am I relying too much on the sales forecast that comes out of a predictive model? Is the “burden of proof” on the model or the dealmakers who are recommending a site? How many people are using their wisdom and experience in the site review process? Marketing, who will need to drive traffic to the store? Merchandising and Operations, who will have to stock it and staff it? With an “app” she can get what she came for. This entry was posted in Art and Science, Decision Making, Modeling and tagged analog, analytics, Decision making, Knowledge Hierarchy, Knowledge management, real estate planning, sales forecasting by Jim Stone. Bookmark the permalink.